I will be doing a handful of MLB organizational "All-Time 25-Man Roster" pieces for the "Call to the Pen" site with Fansided this off-season. This is part of that series. The Seattle Mariners arrived in the Pacific Northwest for the 1977 season as an MLB expansion team. The franchise joined the American League that year along with the Toronto Blue Jays, with Seattle assigned to the AL West Division. It took the M’s until the 1991 season to experience their first winning campaign, and then until 1995 to win their first American League West Division crown. Featuring players such as future Baseball Hall of Famers Ken Griffey Jr and Randy Johnson, and possible future Hall of Famers Alex Rodriguez and Edgar Martinez, they became regular contenders for the first time in those mid-1990’s. The best team in franchise history, which won an American League record 116 games in 2001, developed a few years later when another future Hall of Famer, Ichiro Suzuki, arrived from Japan to begin the 21st century. Putting together an all-time roster in a 25-man format for the Mariners was not as difficult as it might be for some big league clubs with a longer history. My toughest choice turned out to be deciding upon a 10th pitcher. However, there certainly were some decisions that I made where other fans may have gone in a different direction. I would love to read your comments as to any players who I might have missed, all-time great Mariners players who you feel should be recognized here. The following are my choices for the Mariners all-time 25-man roster, along with a brief explanation of the reasoning based on the statistics. The Philadelphia Phillies were the defending world champions, facing the 26-time World Series winning New York Yankees. The Philadelphia Phillies, defending World Series champions, had captured the opener of the 2009 Fall Classic against the 26-time champion New York Yankees. However, the Yanks stormed back, winning three straight to take a commanding lead of 3-1 as the series reached a fifth game at Citizens Bank Park in South Philly. The Yankees were hoping to add a 27th title, and would be just as happy to get it over with right here in the City of Brotherly Love as to let the Phillies think they could get back into the series. The Fightin' Phils were fighting now to keep their season, and their dreams of a repeat, from dying in front of their home fans as Game Five of the 2009 World Series got underway. Yanks' skipper Joe Girardi would give the starting assignment to 32-year old righty A.J. Burnett, who the club had signed as a free agent the previous off-season. Burnett had shut the Phillies down in Game Two to even things up, and Girardi sent him out to the mound to try to duplicate that effort and nail down a championship. Charlie Manuel turned back to 31-year old lefty Cliff Lee, obtained in a big trade with Cleveland just three months earlier. Lee had masterfully handled the Yankees juggernaut in winning Game One. The Yankees wasted little time in trying to send Lee the message that they wanted the crown, and that he wasn't going to get in their way. The Philadelphia Phillies were the defending World Series champions when the 2009 Fall Classic opened against the New York Yankees in the Bronx. As the Philadelphia Phillies prepared to open defense of their World Series championship, a major historic stumbling block stood in their way. The New York Yankees were 26-time World Series champions, and the current team had a powerful lineup of their own. Playing their first season in the "new" Yankee Stadium, the Bronx Bombers had won 103 games, capturing the AL East Division crown by eight games over the rival Boston Red Sox. The Yanks swept out the Minnesota Twins in three straight games in the ALDS, and then captured their 40th American League pennant by battling past the Los Angeles Angels in six games in the ALCS. For their part, the Fightin' Phils had won 93 games, but had stumbled down the stretch, losing nine of their final 15 games. With the NLDS tied at a game apiece against the Colorado Rockies, the Phils went to frigid Coors Field and came away with a pair of hard-fought wins in the final inning to advance. The Philadelphia Phillies franchise had won just a lone World Series title over its first 125 seasons, until this cool October evening in 2008. The Philadelphia Phillies franchise was founded for the 1883 season in the National League, and is the oldest continuous same name, same city franchise in all of North American pro sports. 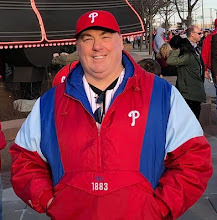 However, for all of their history, the Fightin' Phils had won the World Series, the championship of American professional baseball, just once, in 1980. The 2008 Phillies had won the National League East Division crown for a second straight season, then fought past the Milwaukee Brewers and Los Angeles Dodgers to reach the World Series for the sixth time. They were underdogs to a young, talented Tampa Bay Rays club. But after taking the opener and escaping Florida with a split of the first two games, the Phillies captured a dramatic Game Three in walkoff fashion, then punished the Rays by pounding their way to a blowout win in Game Four. 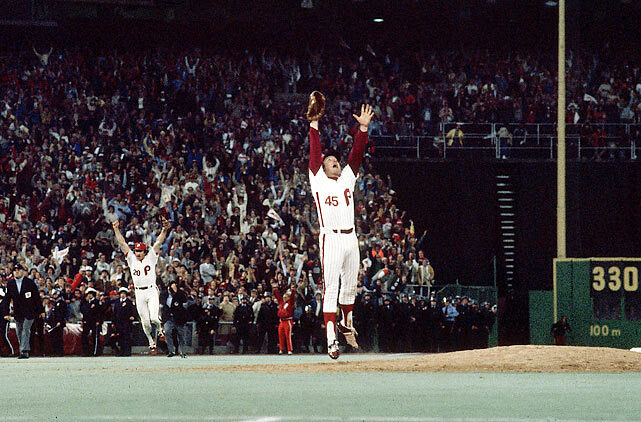 On Monday night, October 27th, the Phillies took the field in front of a jam-packed, rally towel waving, frenzied crowd of 45,940 at Citizens Bank Park hoping to clinch a second world championship. The Rays were just trying to win Game Five of the 1980 World Series to stay alive. A victory would take away the Phillies momentum, cut the Phils' lead down to 3-2, and send the World Series back to Tampa. The World Series, the official championship of Major League Baseball, is being conducted now for the 112th time, and there are eight current organizations that have never won. As the Chicago Cubs and Cleveland Indians battle for the 2016 World Series crown, much has been made of the fact the neither organization has won the championship of Major League Baseball in a very long time. The Indians last won the World Series way back in 1948, just a couple of years after the end of World War II and prior to the dawn of the age of television. The Cubs have not won since 1908, and have for more than half a century been living under the infamous "Curse of the Billy Goat" and in the shadow of Steve Bartman. With the Cubs' victory in Wednesday's Game 2, the 2016 World Series is now even at a game apiece. At some point in the next week, one of these two teams is going to end their long drought, and there will be much joy and celebrating. Meanwhile, the losing team and their fans will remain frustrated. They will remain without having won a championship for generations. But as long as it has been for those two organizations, there are clubs and fan bases out there who are just as frustrated. In fact, there are teams whose fan bases have never been able to celebrate a World Series title at all. The Philadelphia Phillies met the Tampa Bay Rays in the 2008 World Series, and the crucial Game Four took place at Citizens Bank Park in South Philly. In the 2008 Fall Classic, the Philadelphia Phillies had scratched out a walk-off victory in Game Three at home to take a 2-1 lead over the visiting Tampa Bay Rays, setting the stage for a pivotal Game Four. The Fightin’ Phils were in the World Series for the sixth time in club history, but now in the franchise’ 126th season there was still just the lone 1980 series win. The Rays were in just their 11th season of play, and had become champions of the American League after experiencing their first-ever winning season in 2008. Still, the young and talented Rays had been made the series favorites over the more seasoned and experienced Phillies by many prognosticators. The Phils were trying to take advantage of having split the first two in Tampa. Now having taken a 2-1 lead, they were trying to put a stranglehold on the club’s second-ever world championship. Manager Charlie Manuel had thrown his top two starters, Cole Hamels and Brett Myers, in the first two games down in Florida, and then went with the seemingly ageless Jamie Moyer for the third game. The Phillies’ fourth starter was Joe Blanton, obtained from the Oakland Athletics in a deal just two weeks prior to the non-waiver deadline in exchange for three prospects. During the regular season, the Phils had used 24-year-old Kyle Kendrick and 30-year-old veteran Adam Eaton at the back-end of their rotation. However, Eaton began falling apart in late June, and Kendrick was in his first full season. After Eaton suffered back-to-back horrendous starts in early July, the Blanton deal was struck. The 2016 World Series gets underway on Tuesday night at Progressive Field in Cleveland between the host Indians and the Chicago Cubs. 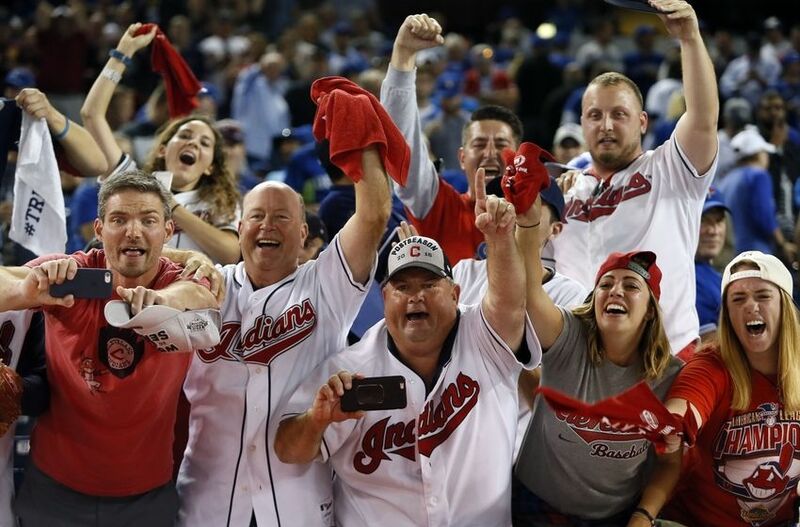 The 112th World Series, the championship of Major League Baseball for the 2016 season, will get underway with Game One on Tuesday night at Progressive Field in Cleveland, Ohio. The Cleveland Indians were champions of the American League Central Division with a record of 94-67, swept the Boston Red Sox in three straight in the ALDS, then defeated the Toronto Blue Jays in five games in the ALCS. The Chicago Cubs were champions of the National League Central Division with a record of 103-58, downed the San Francisco Giants in four games in the NLDS, then beat the Los Angeles Dodgers in six games in the NLCS. Despite producing nine fewer victories during the regular season, the Tribe has home field advantage for the Fall Classic thanks to the American League's 4-2 win in the All-Star Game back in mid-July. It goes without saying that these are two of baseball's best ball clubs. You simply do not reach the World Series without being one of the handful of best teams in the game. Beyond the standings, a look at some of the statistics for the two teams reveals just how good they are, and demonstrates that this series could be evenly contested. The Philadelphia Phillies have appeared in the World Series seven times, and have won fourteen games in the Fall Classic over those appearances. A year ago, I began a “Phillies Fall Classics” series presented in a Super Bowl format (Phillies Fall Classic I, II, III, etc) covering each of the fourteen games won by the Philadelphia Phillies franchise. There have been seven different appearances by the Fightin’ Phils in the World Series over its now 134-year history: 1915, 1950, 1980, 1983, 1993, 2008 and 2009. My series began last October with the very first World Series game in franchise history, a victory in the 1915 opener against the Boston Red Sox at Baker Bowl behind the pitching of Hall of Famer Grover Cleveland Pete Alexander. Through 1915, the Phillies had been a moderately successful ball club (2,324-2,237) since first taking the field for the 1883 season. They would, in fact, continue to win big for two more years. Between 1905-1917 there had only been three losing seasons for the Phillies and their fans. But beginning with a 55-68 mark in the 1918 season, a horrendous three-decade stretch of mostly cellar-dwelling campaigns would unfold. The ‘Whiz Kids’ brought National League baseball excitement back to town for a few years from 1949 through the early 50s, including the club’s second-ever NL pennant in 1950. Unfortunately that 1950 club was swept by the New York Yankees in the World Series, and was thus shutout of my series as well. This would be the last Phillies team to reach the Fall Classic for three decades. The Cleveland Indians hosting Game 1 of the 2016 World Series at Progressive Field on Tuesday night are largely a homegrown success story. 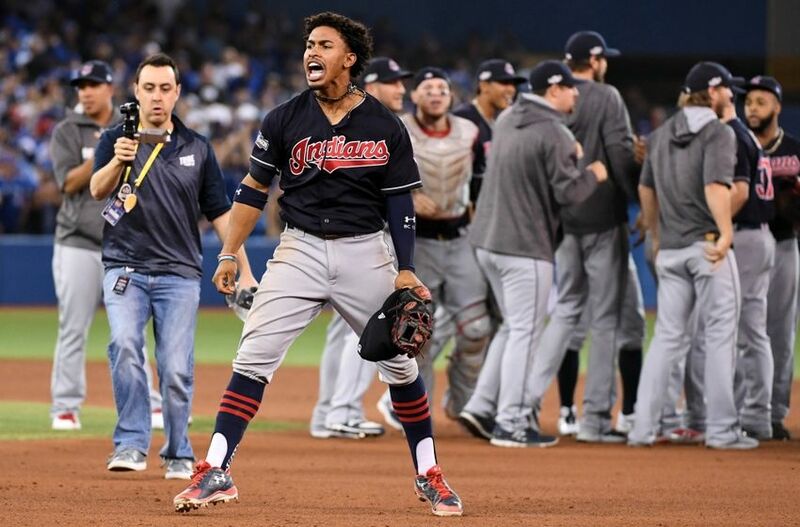 Like most teams that enjoy success in Major League Baseball in the 21st century, the Cleveland Indians have found it imperative that most of the on-field talent helping you achieve that success is homegrown. By “homegrown” in this baseball sense, I mean a player who was either drafted or signed as an amateur free agent and then developed through the club’s minor league farm system. The Indians will host the first two games of the World Series on Tuesday and Wednesday night at Progressive Field in Cleveland. This will mark the first time in nearly two decades that the Tribe have played hosts to the Fall Classic. Both the 1995 and 1997 teams reached the World Series. Cleveland lost in six games to the Atlanta Braves in ’95, and then in a heartbreaking seventh game to the Florida Marlins in that ’97 postseason. The 2016 version of the Indians has a number of key additions to the roster acquired via trade, such as ALCS MVP reliever Andrew Miller, ace starting pitcher Corey Kluber, slugging first baseman Mike Napoli and veteran DH Carlos Santana. However, the Indians are largely a team made up of a homegrown core drafted or signed by the organization and then molded in places such as Mahoning Valley (short season), Lake County (A), Akron (AA), and Columbus (AAA), all of which have been Cleveland affiliates for at least eight years. Of the 25 players who were on the Tribe’s ALCS roster, against the Toronto Blue Jays, 10 were homegrown products. 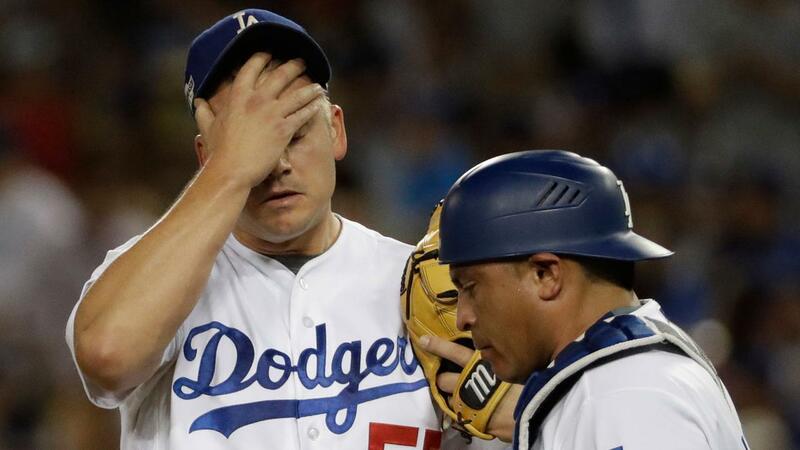 The Los Angeles Dodgers were bombed in the pivotal Game Five of the NLCS by the Chicago Cubs last night, and a former Phillies World Series hero surrendered the key blow. By this point in the 2016 MLB postseason, fans of the Philadelphia Phillies already know that one of the subplots involves a handful of their former heroes who are now wearing Dodger blue. 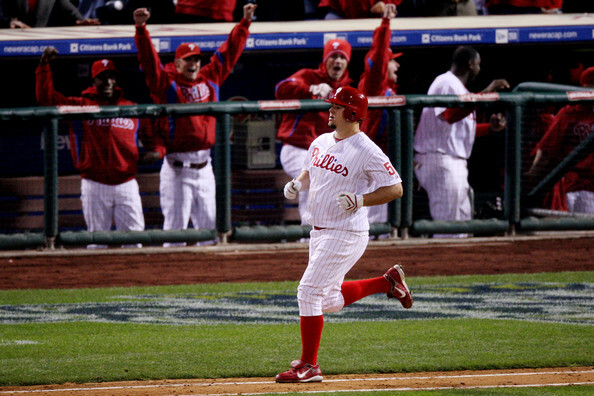 Chase Utley, Carlos Ruiz and Joe Blanton were all key performers at this time eight years ago as the Fightin' Phils fought their way to the franchise' second-ever World Series crown. 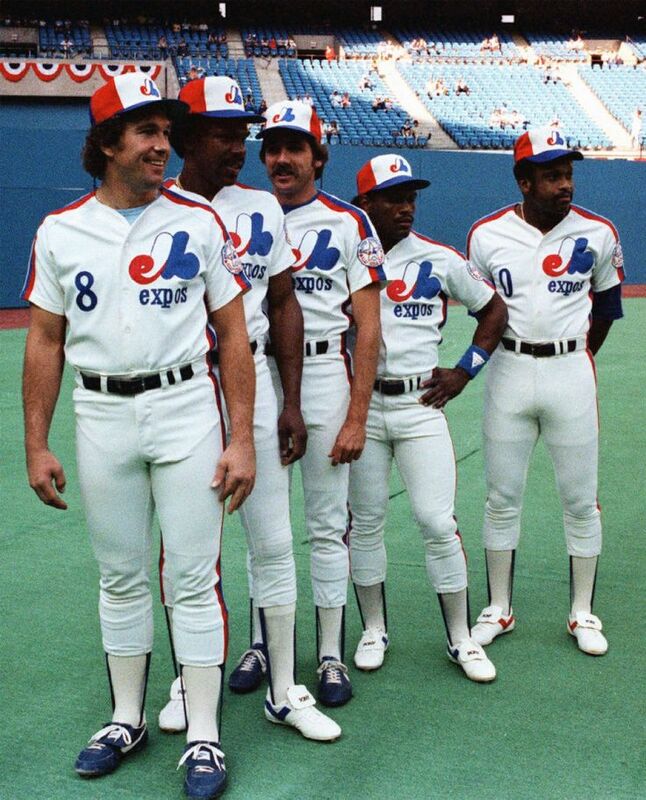 All three were eventually traded to the Dodgers. Utley went in August of 2015, and Ruiz this past August. Blanton took a bit more of a circuitous route to this NLCS appearance. He was dealt by the Phils to the Dodgers back in August of 2012. Over the next four years, Blanton bounced around four more organizations before signing back with the Dodgers this past January. Reinvented as a relief pitcher, Blanton proved a revelation on the mound this season, appearing in a career-high 75 games for Los Angeles. Blanton's numbers: 2.48 ERA, 1.013 WHIP, just 55 hits allowed over 80 innings pitched with an 80/26 K:BB ratio. 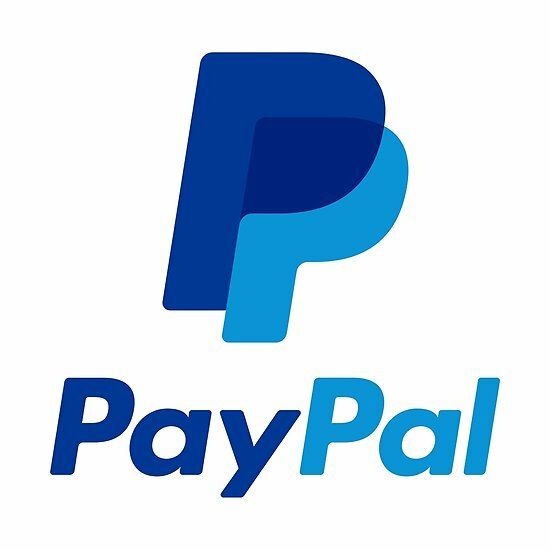 The "Sports Talk Philly" site is doing a Top 25 Phillies of All-Time series, and approached me about doing some of the older players on their list. This is the first of my contributions for the series. There are old-timers, and then there are OLD-timers. Roy Thomas is the latter, a ballplayer who most modern Philadelphia Phillies fans have never heard of previously. Thomas appeared with the Phillies in parts of a dozen seasons, first for a decade straight from 1899-1908, and then again over his final two seasons in 1910-11. His brother Bill played one season in the big leagues, also with the Phillies, for six games in the 1902 season. Thomas was a local product, born in Norristown and raised in the small community of Sheetz's Mill, just outside of Norristown. Per Bill Lamberty at SABR, Thomas was raised by strict Christian parents who forbade him playing on Sundays, a practice that he would later take into his professional baseball career. Thomas went to the University of Pennsylvania as well, earning an Ivy League degree in 1894, and starring for the Quakers baseball team. After graduation, Thomas began to play semi-pro ball in the area. Finally coming to the attention of pro scouts, Thomas broke in with the Phillies in 1899 at age 25. Thomas put together an outstanding 13-year big league career spent mostly with the Phillies. Upon his retirement, he was the head baseball coach at Penn for a decade, compiling a 106-43-3 mark from 1909-19. The Chicago Cubs and the Los Angeles Dodgers are tied at a game apiece in the 2016 National League Championship Series as the two teams get set for what should be three exciting nights of October baseball in L.A. beginning on Tuesday night. In addition to being the most exciting time of the year in Major League Baseball, the month of October is also designated as National Domestic Violence Awareness Month here in the United States. This month there will be a concerted effort to educate the public on this important issue. It is an opportunity, as the National Network to End Domestic Violence states, to “raise awareness about domestic violence” and to join efforts to end that violence. One of the key players during this NLCS for the Chicago Cubs is closer Aroldis Chapman, obtained by the team just prior to this season’s non-waiver trade deadline from the New York Yankees. A 28-year-old flame-throwing left-hander who defected from Cuba in 2009, Chapman is a four-time NL All-Star who holds the MLB record for throwing the fastest pitch (105.1 mph). He is the acknowledged hardest thrower in the game today, and one of the hardest throwers of all time. In addition to being a key player on the baseball diamond this October, Chapman also has a link to that other October event relating to domestic violence awareness. Chapman is an accused domestic violence abuser. As the American League Championship Series moves north of the border into Canada on Monday night, the host Toronto Blue Jays find themselves in desperate straits. The Blue Jays trail the visiting Cleveland Indians by two games to one in the best-of-seven series, and simply cannot afford to fall into a 3-0 hole. There have been 35 postseason series in Major League Baseball history that started with one team running out to a 3-0 lead. Only the 2004 Boston Red Sox have won, rallying from that 0-3 deficit to take four straight from the arch-rival New York Yankees, a springboard to the BoSox ending their “Curse of the Bambino” by eventually winning the World Series. Grant Brisbee with SB Nation did a nice breakdown of this situation when the Baltimore Orioles fell behind the Kansas City Royals by 3-0 in the 2014 ALCS, and when the Chicago Cubs fell behind the New York Mets 3-0 in last year’s NLCS. If the Jays are to save their season and get into this series, they are going to need a big effort in front of the frenzied fans at Rogers Centre. 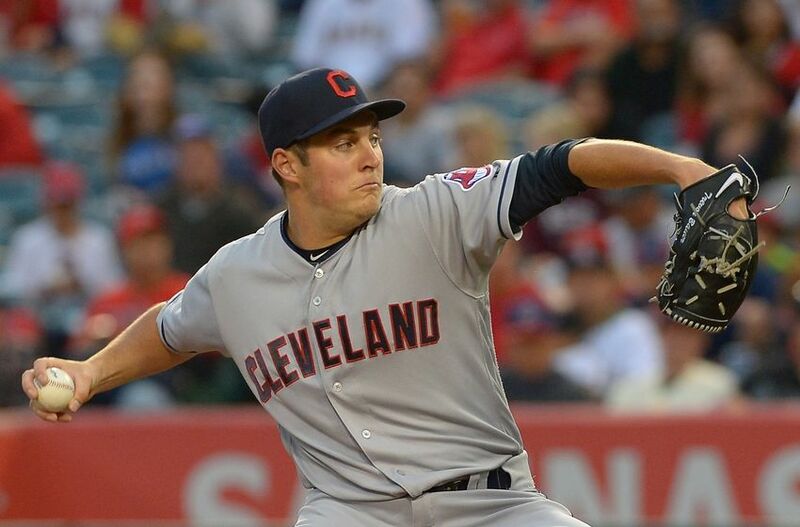 Fortunately for the Blue Jays, they may have just the antidote to their ills in Cleveland starting pitcher Trevor Bauer. 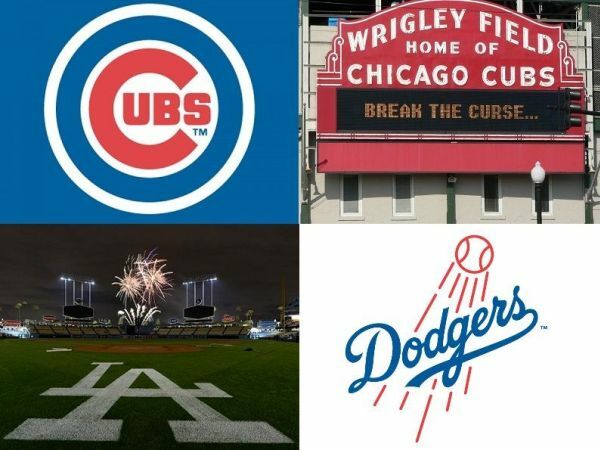 The 2016 National League Championship Series between the NL West champion Los Angeles Dodgers and NL Central champion Chicago Cubs begins on Saturday night at Wrigley Field in Chicago. The host Cubbies, who famously have not won a World Series since 1908, went wire-to-wire to win their division going away by 17.5 games with a 103-58 record. The visiting Dodgers last won the Fall Classic back in 1988. They struggled early, falling below .500 as late as May 22nd. But the club rallied over the summer, and stormed past the arch-rival San Francisco Giants in late August, ultimately winning the division by four games. Manager Joe Maddon then guided the Cubs past those Giants in the NLDS in four games, but not without drama. Chicago won the first two games, but San Francisco won game three and held a 5-2 lead into the 9th inning of Game Four, looking to tie things up and force a winner-take-all deciding game. The Cubs rallied off an embattled Giants bullpen, scoring four times in the top of the 9th for a 6-5 victory which advanced them into the NLCS for a second straight season. They were swept a year ago by the New York Mets. The Dodgers found themselves in even more dire straights in their NLDS against the Washington Nationals. Los Angeles trailed the Nats by two games to one, and Game Four rolled into the bottom of the 8th inning at Dodger Stadium tied at 5-5 with the hosts facing elimination. But the Dodgers came up with a run to win it, then took a dramatic 4-3 victory in Game Five back in Washington thanks to big relief work from Kenley Jansen and Clayton Kershaw. Eight years ago tonight, the Philadelphia Phillies defeated the Los Angeles Dodgers by a 5-1 score in Game 5 of the NLCS at Dodger Stadium to win the National League pennant. That team would go on to defeat the Tampa Bay Rays in five games to win just the second World Series crown in what was then 126 seasons of Phillies baseball. Three key players on the team that dispatched the Dodgers and won it all in that fall of 2008 are now playing different, but no less important roles for Los Angeles as the NLCS opens on Saturday night at Wrigley Field. 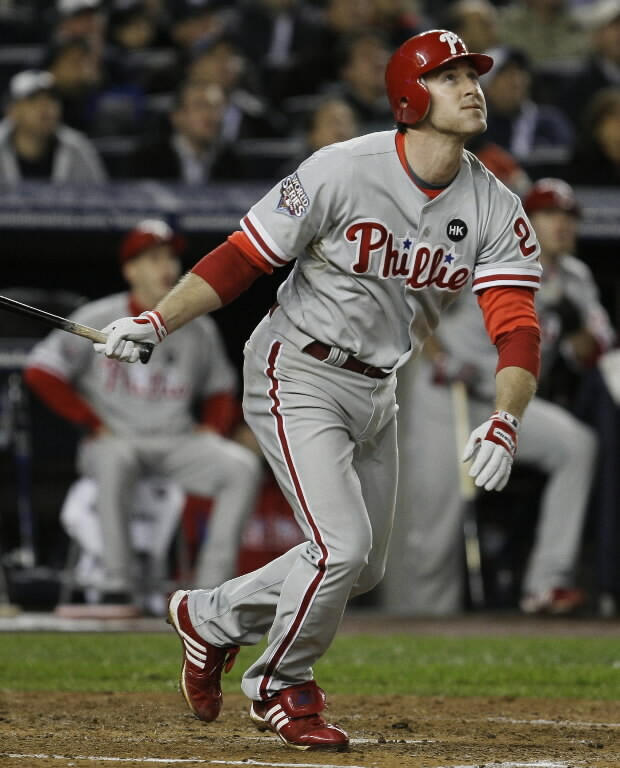 Chase Utley was a 29-year-old superstar second baseman, the best in the game at the position, back in the 2008 season. That year in the midst of his prime as a player, Utley hit for a .292/.380/.535 slash line with 33 home runs, 104 RBI, 113 runs scored, 41 doubles and 14 stolen bases. The American League Championship Series kicks off on Friday night with the AL Central champion Cleveland Indians hosting the AL Wildcard Toronto Blue Jays. Terry Francona's Tribe went 94-67 in winning their division by eight games over the Detroit Tigers. Manager John Gibbons guided the Jays to a tie with the Baltimore Orioles for 2nd place in the AL East at 89-73, four games behind the Boston Red Sox. The Jays then defeated the O's in dramatic fashion in the AL Wildcard Game on a three-run walk-off home run by Edwin Encarnacion in the bottom of the 11th inning. That victory bought Toronto a date with the AL West champion Texas Rangers in the ALDS, and the Blue Jays swept Texas in three straight games by 10-1, 5-3, and 7-6 scores. Meanwhile, the Indians faced off with the Bosox in their ALDS. Cleveland also swept, taking their three games by scores of 5-4, 6-0, and 4-3. The two clubs met seven times during the regular season, with Cleveland coming out on top in four of the seven games. Four of the seven were one-run games, and six were close finals. However, the Jays did spank the Tribe by a 17-1 score on July 3rd. The visiting Washington Nationals had just taken a 2-1 lead over the host Los Angeles Dodgers in the top of the third inning in Monday's third game of a tied National League Division Series game at Dodger Stadium. With Bryce Harper at third base and one out, Nats third baseman Anthony Rendon stepped in against Dodgers' 28-year-old quasi-rookie starting pitcher Kenta Maeda. Maeda may be a "rookie" by Major League Baseball standards and qualifications, but he has eight years of experience in the Japanese Central League as the ace of the Hiroshima Carp. Rendon worked Maeda to a 2-2 count over a half-dozen pitches, and then on the seventh pitch of the at-bat, ripped a 91 mph fastball deep into the left-center field stands for a two-run home run. The blast would prove to supply the winning runs in what would ultimately become an 8-3 Nationals victory at Chavez Ravine, putting Washington up by two games to one in the NLDS. In a lineup that includes high-profile 2015 NL MVP Harper, franchise icon Ryan Zimmerman, veteran postseason hero Jayson Werth, and 2015 postseason star Daniel Murphy, Rendon can often get lost, especially to the average baseball fan. 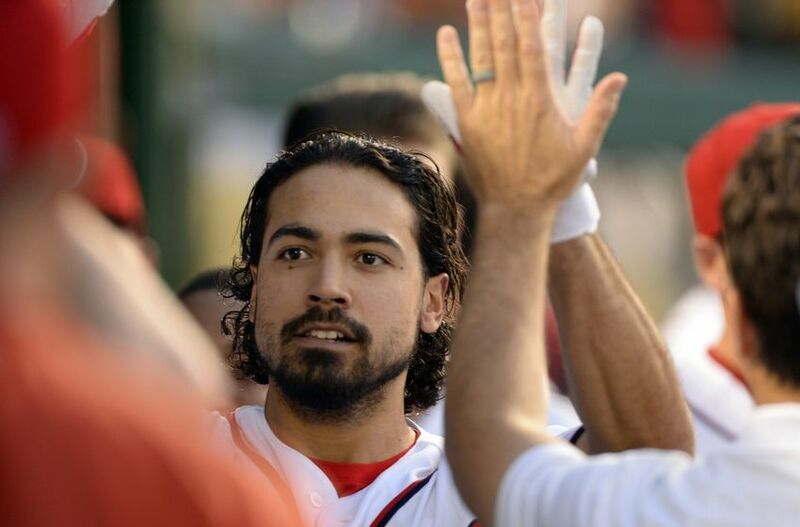 But ask any Nationals player and fan, and they will tell you that the 26-year-old Rendon is a key to any success that the team enjoys. When Grapefruit League action ended and the Philadelphia Phillies left their spring training home in Clearwater, Florida back at the end of March, there were few who held high hopes for the coming 2016 season. 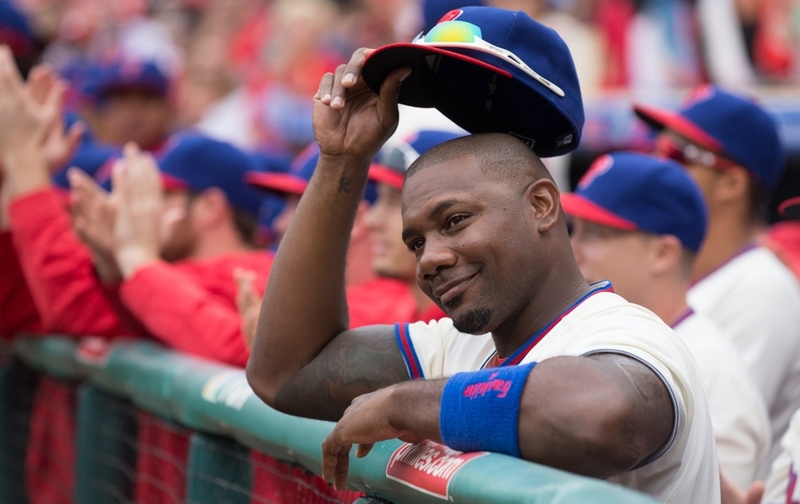 The Fightin' Phils had ceased any serious fightin' after a .500 season in 2012, one which put an end to a streak of five consecutive NL East crowns and nine straight winning seasons. Entering 2016, the club and its fans had suffered through three consecutive losing seasons, including a 63-99 debacle a year ago that was the franchise' worst since 1972, and left them at the very bottom of Major League Baseball. So when 2016 opened with the Phillies getting swept out of Great American Ball Park by the host Cincinnati Reds, it just seemed like the team was in for more of the same. After two weeks, they were still struggling along at 6-9 after losing four of their five games leading up to that point. Then something suddenly and quite unexpectedly changed. The Phils walked-off the Washington Nationals and their own former closer, Jonathan Papelbon, on a mid-April Sunday afternoon at Citizens Bank Park. That thrilling victory sparked a run of winning baseball, the likes of which had not been seen down in South Philly since the 2011 Phillies were setting a franchise record by wrapping up a 102-win campaign. From that point through mid-May over a full month of the baseball calendar, the Phillies went 18-8 and surged up the NL East standings. For a few heady hours following a 4-2 afternoon home win over the Miami Marlins on Wednesday, May 18th, the Phillies were tied for first place in the division. That night, the Nationals stomped the New York Mets, pushing a half-game up on the Phillies, who would never again reach the top of the standings this season. There were fans who were getting carried away with things here in Philly during that run, believing that it was possible that the club was ahead of schedule in their rebuilding program, and that perhaps they were ready to at least stay in the NL Wildcard conversation over the summer.